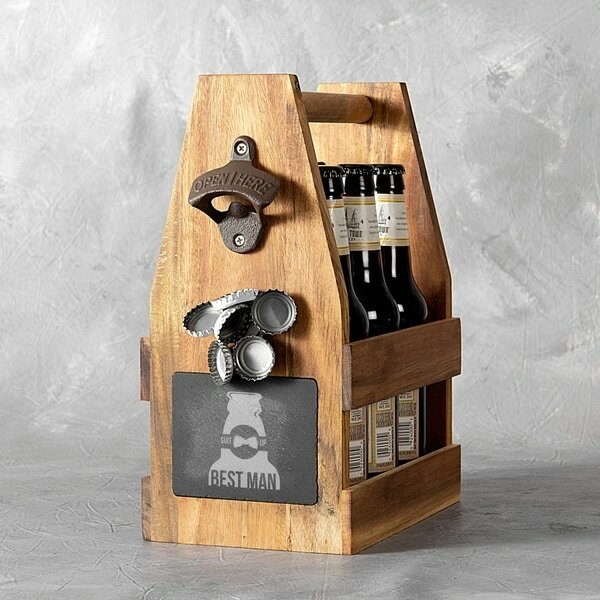 The Best Man Acacia Craft Beer Carrier makes the perfect attendant gift for the top guy in your wedding. The carrier is large enough to hold six bottles of beer and is elegantly built with sturdy acacia wood. The handle runs the length of the carrier and is designed for easy transporting. The unique Best Man design makes it an impossible to forget piece. Dimensions: L: 9" W: 5.125" H: 11.75" Features: acacia wood with slate accent, magnet cap catcher Materials: Acacia wood, slate, metal. Please note: Naturally occurring variations, including knots, notches and swirls in the wood grain, are inherent to the material. Care Instructions: Wipe clean with a soft damp cloth. Engraving Options: Available as shown only. While stocking stuffers are usually smaller and less expensive than what you put under the tree, they're a thoughtful way to celebrate those on your list. Check out the list below for the best stocking stuffer ideas for adults.